I personally loved this soup! I just wish I had a good blender to get things to a nice, smooth consistency because the rest of the family was a little put off by the texture. The flavors were amazing though and it was super simple to put together! 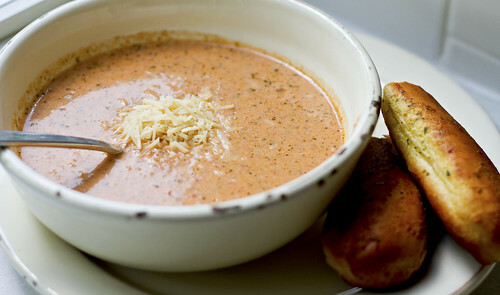 (recipe from The Recipe Club) Now if our weather would just cool down so we could really enjoy more soups! Heat oil in a medium large soup pot. Add onions and cook over medium-low heat until completely translucent. Add chicken stock. Bring to a simmer and allow to simmer for 15 minutes. Blend to desired consistency with hand blender, food processor or blender. *Garnish with shaved Parmesan cheese and homemade sour dough croutons! 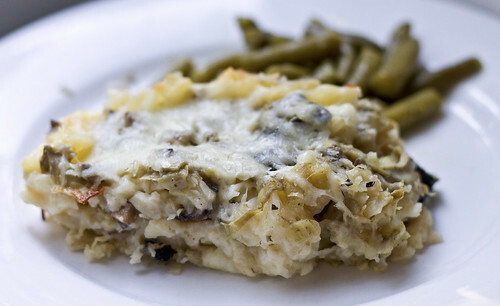 This is another great recipe from Mel's Kitchen Cafe. She said there had been mixed reviews of this recipe but that she still really liked it, so I was curious to see what we thought of it and Mike and I both LOVED it! Just be warned that you'll want to open some windows in your kitchen to air it out after you make it :-). Cut chicken into 1-inch pieces. Place in medium bowl. Stir together curry, 1/2 teaspoon salt, pepper and chili powder. Sprinkle over chicken, tossing to coat evenly. Cover and chill for 1 to 2 hours. In a large nonstick frying pan, stir onion, basil, garlic and peppers in hot oil over medium-high heat for 3-4 minutes, until onion is translucent. Add chicken and remaining 1/2 teaspoon salt and cook for 5-6 minutes until no longer pink. Combine coconut milk and cornstarch and whisk well to combine. Carefully add to skillet, whisking vigorously. Cook and stir until slightly thickened and bubbly. Stir in ginger. Cook and stir for another minute. Serve over hot rice. Hooray for another crock meal! I found this recipe on Gina's Skinny Taste, which I found out about from The Daily Dish...I love the new discovery of awesome recipe blogs! 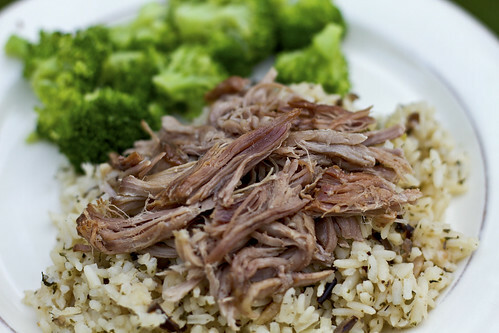 This recipe had a lot of things going for it...the crock pot, 4 ingredients, kid friendly, and of course yummy too. 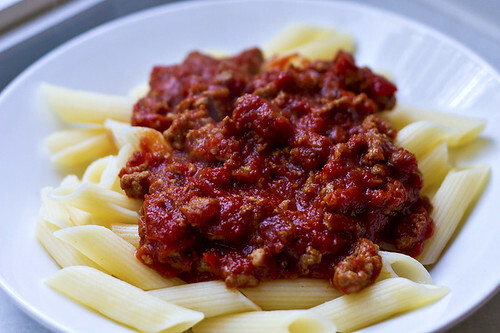 We had this on Sunday and it was such a perfect meal because it was super fast to throw in the crock pot before church and then was already to eat when we got home. I ate mine over gluten-free penne pasta and the rest of the family had it over spaghetti noodles. Brown the sausage in a large skillet, breaking up any large pieces with a wooden spoon. When sausage is browned, drain if needed and add to crock pot. Clean skillet with a paper towel and set flame to high; when hot add oil. Add garlic and cook until golden but do not burn; add tomatoes and garlic to crock pot along with fresh cracked pepper. Cover and cook on low for 6-8 hours. If you wish, take an immersion blender and blend the sauce a 2-3 seconds to break the sausage up into smaller pieces to combine with the sauce. I've been trying to have at least one crock pot meal planned for the week because our Tuesdays and Wednesdays can get pretty crazy and it really helps our evenings go more smoothly. 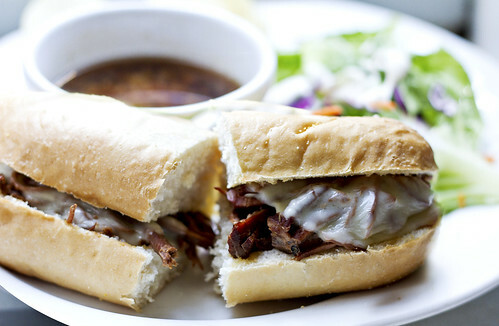 After seeing a recipe on Melissa's Bargains for French Dip Sandwiches recently they were on my mind already and then as I was searching blogs for crock pot meals I saw this recipe on Our Best Bites and added it to our menu for the week. It was probably one of the easiest meals I have ever made and it was one of the most well received too. EVERYONE ate it and loved it! Heat oil in a large pot over medium-high heat and rub roast with salt and pepper. When very hot, carefully place roast in pan and sear on all sides. You're not cooking the meat, you're just browning it quickly on all sides to add flavor and seal in the juices. Place in crockpot and sprinkle with onion soup mixes. Pour water and beef broth over roast. Cook 8-10 hours on low or cook 4-5 hours on high and another 3-4 hours on low. It's hard to screw this part up; basically, the longer it cooks, the more tender it will be. But you know it's done when you pop a fork in it and the meat just falls apart. When meat is ready, shred with a fork. Place meat in crusty rolls. Top with cheese and broil open-faced in the oven or toaster oven for a few minutes, until bread is golden and cheese is melted. Ladle juices into small cups for dipping and enjoy! I was looking for a fun, easy treat to make with the kids and saw these on Our Recipe Box. 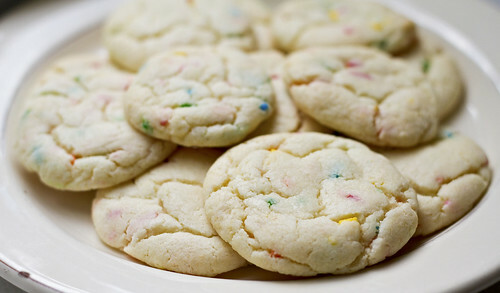 They were seriously THE easiest cookies ever! The kids loved helping me roll the dough into balls and of course really loved eating them. I want to try this trick with some other cake mix flavors! Preheat oven to 375 degrees. In large bowl, combine cake mix, oil and eggs. Stir until thoroughly moistened. Shape dough into 1-inch balls; place 2 inches apart on ungreased cookie sheet. With the bottom of a glass dipped in sugar, flatten balls to 1/4 inch thickness. Bake for 6-8 minutes until edges are light golden brown. Cool one minute then move to cooking rack. 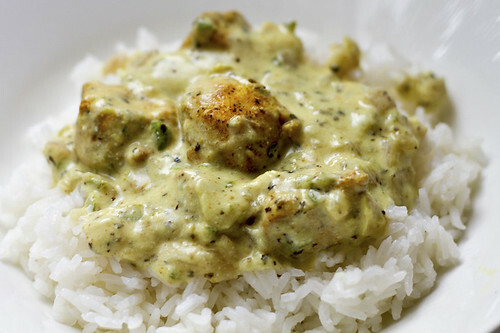 This was another recipe I found on Delicious Dishes. 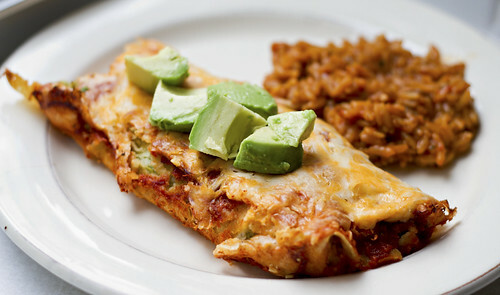 It is such a bummer when recipe sites you like stop posting, but at least you can always go back through the old ones! This was really yummy and could easily be a main course meal. I served it with some chicken just because I knew it wouldn't work as a meal for my family, but I would have been fine without anything else. 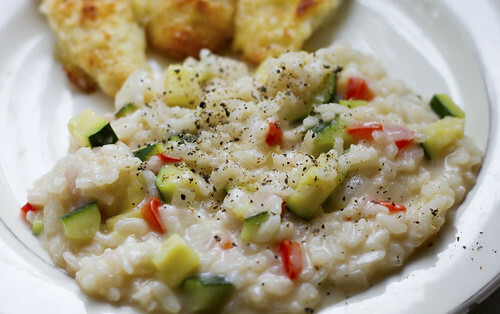 I love zucchini and I love risotto so it was a great combination for me! In heavy saucepan, saute rice in butter stirring constantly. Add onion, red pepper, and garlic salt. Saute until onions and peppers are tender. Add 1 cup chicken stock, stirring frequently. As the liquid cooks down, continue adding 1/2 cup stock at a time until all the stock is used and the mixture is creamy. Keep stirring! In a small bowl, combine soy sauce, salt, Worcestershire sauce, ginger and garlic. Mix well. Lay 3 sheets of aluminum foil out, one on top of another. Place roast in center of aluminum foil; rub with soy sauce mixture and sprinkle with liquid smoke. Fold all 3 sheets of aluminum foil over top of roast and secure tightly. Place wrapped meat in a baking pan. Roast at 375 for 5 hours. Shred the pork before serving. 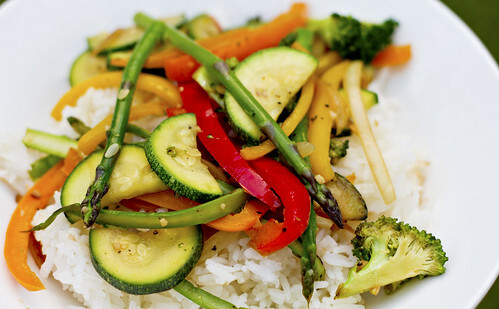 When I saw this yummy dinner on The Daily Dish, I instantly knew I wanted to try it! 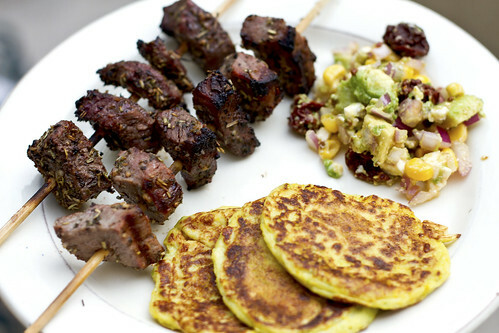 I love all kebabs and the squash and chive pancakes sounded awesome! The pancakes were our favorite part of the dinner and we'll definitely make them as sides for other dishes in the future. The beef had an awesome flavor (even though I only marinated it for 2 hours) and it was a perfect combo with the relish. The relish was my least favorite part of the meal, I think I'm just not used to the strong flavor of the sun-dried tomatoes, but I did love the way the 3 things complimented each other. Plus, it all looked so fancy together which is always fun :-)! 1. Place the squash in a large pot. Fill with water making sure to cover the squash completely. 2. Bring the pot to a boil and cover, cooking until soft. 3. Once soft, drain and set to the side to cool for a few minutes while you chop the rest of your ingredients. 4. After the squash has cooled down a bit, add them to a food processor and pulse until crushed. 5. Place the squash in a large mixing bowl with the egg, egg white, flour, baking powder, garlic, Parmesan cheese, chives, salt, and pepper, and mix until smooth. 6. Spray the bottom of a large griddle pan with canola oil and place the burner on medium heat. 7. Take 1/4 cup of the batter (per 1 pancake) and drop it onto the griddle. Use the book of a spoon to slightly flatten them and cook for a few minutes until golden brown on the bottom side. 8. Once the bottom has cooked, flip the pancake and cook the other side until golden brown. 9. Set the finished pancakes aside on a platter and repeat with the remaining batter until all 12 pancakes are made. Serve and enjoy! 1. In a resealable bag or glass container, combine the olive oil, garlic, rosemary, oregano, garlic powder, salt & pepper with the beef. Refrigerate for a minimum of 6 hours. 2. Once the beef is done marinating and you are ready to begin cooking, place a grill pan on medium-high heat (or preheat your gas or charcoal grill). 4. When the skewers all set, place on the grill pan for about 4 minutes on each side. 5. Arrange the skewers on a plate and serve along side the relish below. 1. In a small to medium-sized bowl, combine the onion, tomatoes, corn, and olive oil. 2. If you are prepping this in advance, refrigerate these ingredients until ready to serve. 3. Just before serving add the avocado and feta cheese before mixing all of the ingredients together. Add the ground black pepper to taste. 4. Serve the relish alongside the beef skewers, and enjoy! * In a large skillet, saute mushrooms in butter until tender. Add garlic; cook 1 minute longer. Add the artichokes, wine, salt and pepper; cook over medium heat until liquid is evaporated. * For the sauce, in a large saucepan over medium heat, melt butter. Stir in flour until smooth; gradually add milk. Bring to a boil; cook and stir for 1 minute or until thickened. Stir in Parmesan cheese and wine. * Spread 1 cup sauce into a greased 13-in. x 9-in. baking dish. Layer with three noodles, 1-2/3 cups sauce, 1 cup mozzarella and 1-1/3 cups artichoke mixture. Repeat layers twice. * Cover and bake at 350° for 45 minutes. Sprinkle with remaining mozzarella cheese. Bake, uncovered, 15-20 minutes longer or until cheese is melted. Let stand for 15 minutes before cutting. I saw these yummy guys in All You magazine quite awhile ago, but the kids and I just got around to giving them a try. They were a big hit! They were easy to make, gluten-free, and surprisingly delicious! We will definitely be making them again and again! * 1. Line a large baking sheet with parchment. Place a small skillet over medium-high heat. Add coconut and toast, stirring constantly, until light golden, 3 to 4 minutes. Transfer to a bowl; let cool. * 2. In a medium saucepan over medium heat, combine honey, corn syrup and peanut butter. Bring mixture to a boil, stirring, then remove from heat and stir in chocolate chips and cocoa. * 3. 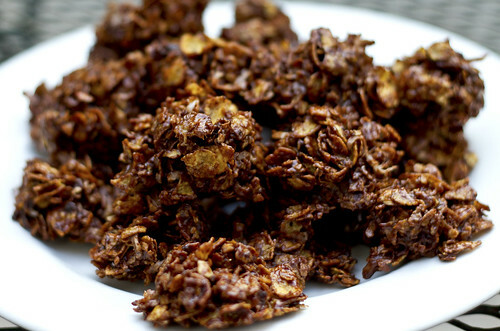 Continue stirring until chocolate chips have melted, then stir in cereal and toasted coconut until well coated. Drop by tablespoonfuls onto baking sheet and refrigerate until set, about 15 minutes. I have tried snickerdoodles, but I have never made my own, so when a volunteer was needed to make some for my book club meeting came up last week I thought it was a perfect opportunity to give them a try! 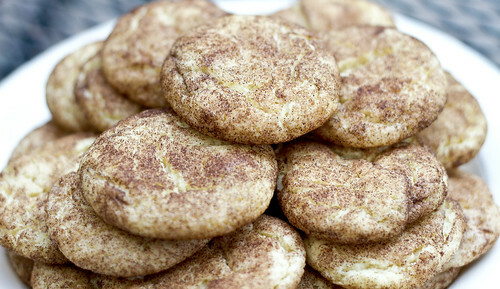 I went to a blog that is known for yummy desserts but quite a few of the reviews of her snickerdoodles said they were spreading too thin when baking. Since baking is not my specialty I decided not to risk and went to allrecipes.com instead. This recipe from Beth Sigworth had awesome reviews (I did tweak it a bit after reading through some comments)! I was so proud that they turned out so beautiful...AND tasted awesome too! They were a hit! 1. Preheat oven to 390 degrees F.
4. Bake 8 minutes (you don't want to over-bake), or until set but not too hard. Remove immediately from baking sheets.